This summer there were several launch events at Pitti Uomo. 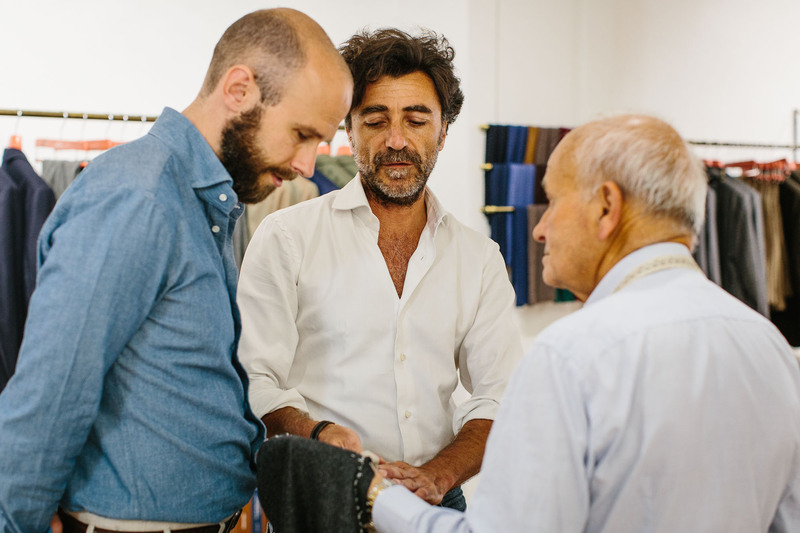 Kenji opened up in Florence again, with his new Tie Your Tie store (small but lovely); Benedikt had his Shibumi showroom with new tailoring; it was effectively the launch of Neapolitan trouser maker Lino Pommella (for whom I, Mark Cho and Antonio Ciongoli designed some denim trousers). 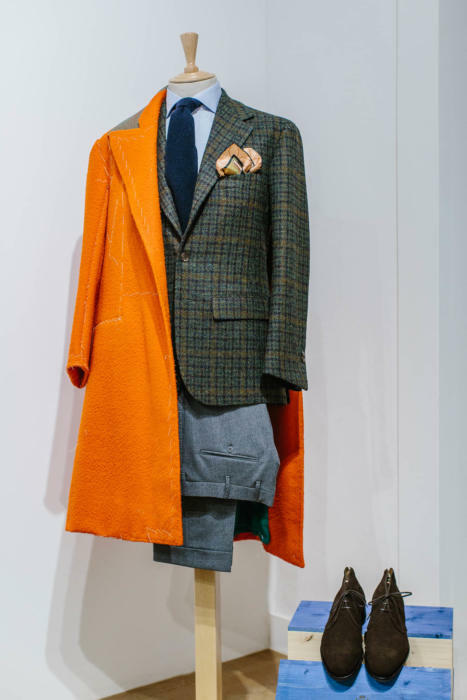 But the biggest launch was undoubtedly Sartoria Vestrucci - the re-born tailoring house being led by Tommaso Melani of Stefano Bemer, and Salvatore Ambrosi. 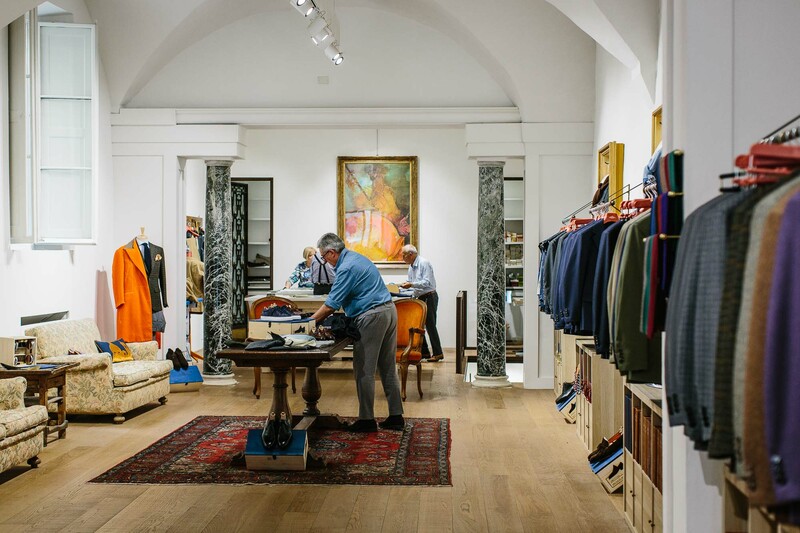 The new Vestrucci has a shop on the south side of the Arno in Florence, with a small entrance but deep space, running back through racks of ready-made tailoring to bespoke cutting tables at the back. At the first table stands Loris Vestrucci, old and already once-retired, picking apart basting stitches. Behind him work two apprentices, hired for him to train and provide some future for the bespoke. Vestrucci himself is smiling and cheeky, muttering his views on any tailoring within his view. 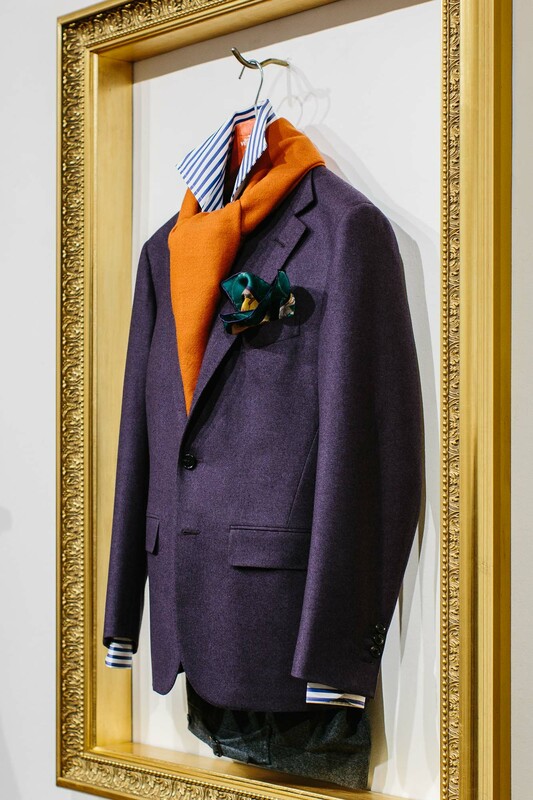 The length of my Caliendo jacket and the flyaway peak lapels of a customer both came in for commentary. I'd been a fan of Vestrucci's style for years without knowing it. Vestrucci cut for my friend Tommaso Capozzoli for years, working at home with his wife. And I had always admired Tom's green tweed jacket and solaro suit among other things. He had also cut historically for several Japanese in the industry - including Kenji Kaga of Tie Your Tie and Kentaro Nakagomi of Coherence. Tom (below, centre) is now the face of Vestrucci, and you will see him on the website as well as on trunk shows to New York and elsewhere. Vestrucci's style will be familiar to those that are aware of the peculiarities of Florentine tailoring. So the shoulder is a little extended, but only lightly padded, with a fairly natural run down into the sleeve. Its width (as we discussed previously here) creates an impression of strength without using padding or roping. 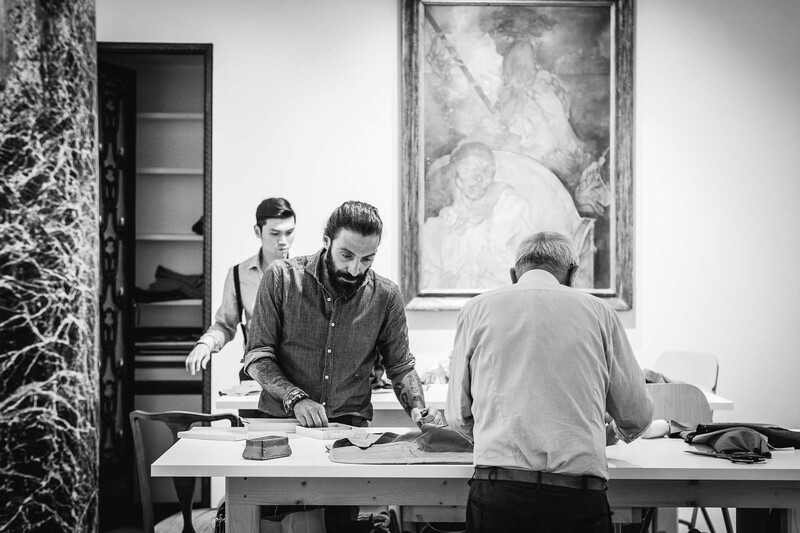 The canvas is similar in weight to other Italian tailors, and the chest is cut clean without being too close. It is accentuated by broad lapels. One difference from other Florentine tailors (most obviously Liverano) is that the lapel is not concave but straight, with even a touch of belly (curving outwards rather than inwards). The front quarters are also relatively closed. The jacket is slightly shorter than most, and in common with other Tuscans has no front seam running down below the hip pocket. The double-breasted jacket has a relatively low and flat gorge. Thankfully this is more in fashion now after years of high, pointy lapels that threatened to flop down the back of the jacket. 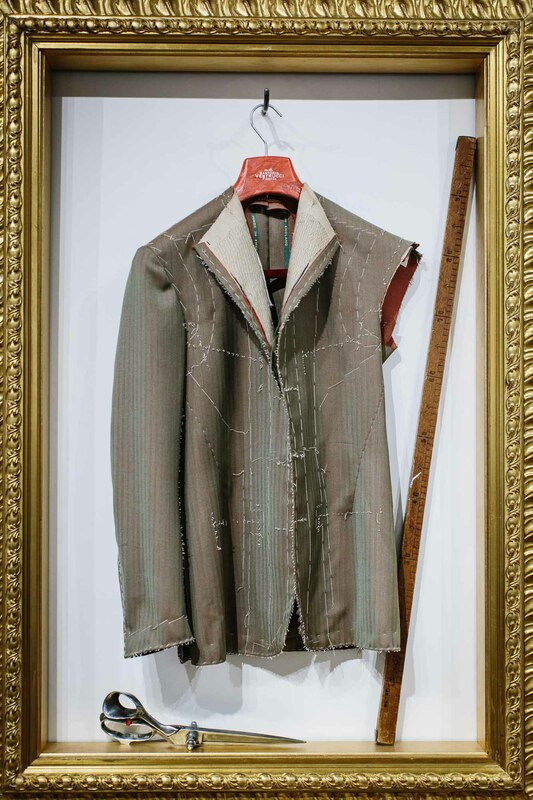 One of the reasons Tommaso Melani says he was excited about launching Vestrucci was that the Florentine style is rather underrepresented in the ready-made market, and that's certainly true - Italian tailoring around the world is dominated by Naples and the Abruzzo region. 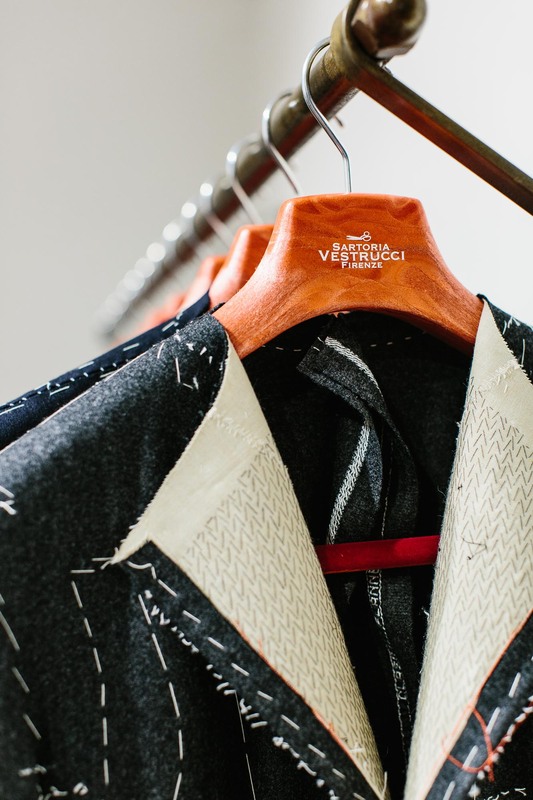 The quality and level of work in a Vestrucci jacket is very high, and a challenge of the new brand has therefore been reflecting it in the ready-to-wear. Here they've largely succeeded, with neat finishing and most of the Vestrucci style details reflected in the jackets. They are made in Italy, although decline to say which factory (which is sensible in my view - too much is often read into manufactures which often offer different levels of quality). 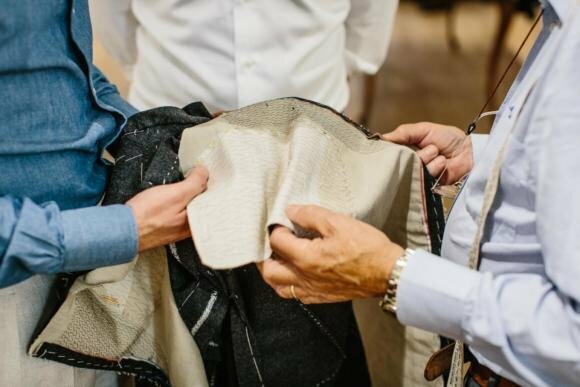 Vestrucci will be doing trunk shows in partnership with Stefano Bemer and Ambrosi - in London and in the Bemer showroom in New York, with more to come. 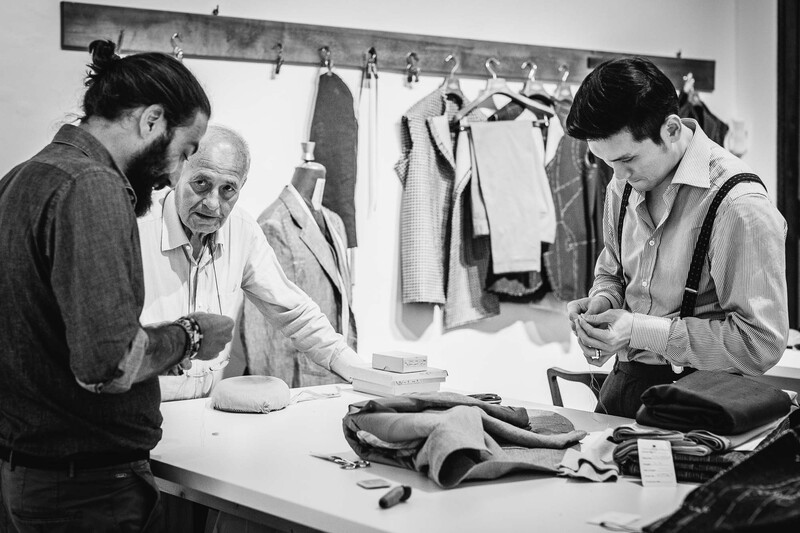 As a strategy it makes perfect sense, with customers now able to have bespoke or RTW shoes, trousers or suits from the same group. How far they can go into the very competitive RTW tailoring market remains to be seen. In the meantime, I highly recommend visiting the Vestrucci shop if readers are ever in Florence. 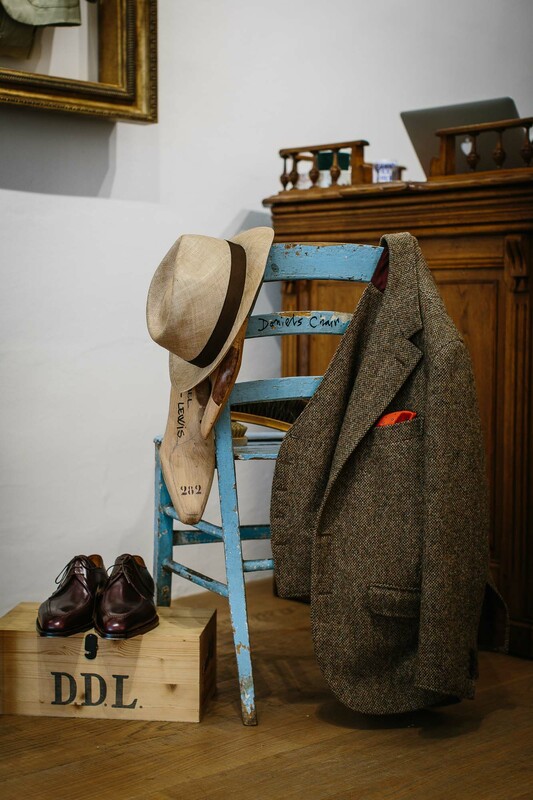 It doesn't have the character of an older tailoring boutique yet, but there is a real range of RTW on display to try on, plus Bemer shoes, a nice range of knitted ties and leather goods. The shop is at 58 Via Maggio. Trunk shows will be announced on their site, as well as on our Trunk Show Calendar. I'll report separately, later, on the Holland & Sherry charcoal-flannel suit I am being fitted for. You can follow the discussion on Sartoria Vestrucci launches: Bespoke and ready-to-wear tailoring by entering your email address in the box below. You will then receive an email every time a new comment is added. These will also contain a link to a page where you can stop the alerts, and remove all of your related data from the site. It’s just occurred to me – being constantly measured up for very expensive bespoke suits year after year, are you always fighting to stay the same weight and shape by living in the gym and eating green leaf salads to avoid having to throw away fits from yester year? Wearing bespoke must consign one’s life to a never-ending diet! Adam makes a good point. Simon, how much room is left on trouser waist to allow for expansion after a heavy meal ? I suffer with bloating which means a 38 inch trouser can start off loose and end up tight as the day progresses ! What did Mr Vestrucci have to say about the length of your Caliendo jacket? Simon could you recommend any RTW brands that use side ajusters for their formal trousers? I bought an Ozwald Boateng RTW suit recently which happened to have side-adjusters on the trousers. That being said, with hindsight, for the price (£2,200+ with alterations), I feel like I should have gone bespoke at somewhere like Whitcomb and Shaftesbury, or back to Graham Browne for another commission (with some change left over). What’s the suit like? I had one years ago and was pretty happy with it. My bespoke? Can’t really comment effectively yet, given it’s a first fitting. I am really look forward to see your suit be finished and have more information on how’s Vestrucci style details look like. BTW, price of Bespoke start from €6000 ex-VAT is really quite high, even more than Liverano or Cifonelli as I remember. Those jackets look superb and your description of the construction in terms of an effective compromise between heavy canvassing and completely unstructured looks attractive (the cut of that green check jacket looks excellent). Couple of questions – are their jackets typically in the wool cloths shown in the photos? Secondly on the subject of construction it would be very informative to see the internal structures of English and the various regional Italian styles together with the finished items as a comparison. Have you already done this and if not would you consider this as a future posting? Sure, I can look into it. Generally, though diagrams or similar are better for showing these things – you can’t tell the weight of a canvas very easily from a photography, for example. And on the Vestrucci jackets, no there is quite a range of cloths. Simon those prices are incredibly high for bespoke and definitely for RTW. The market is extremely limited for 3k euros RTW suits. Where the market exists it’s usually high end fashion brands like t ford who are selling a lifestyle brand with huge marketing behind it. What is the reason for this pricing strategy? Curious from a business perspective. Six grand? I’ll stick with Steed. One of the issues which puts me off Italian tailoring is the ( to my mind ) very short jackets which predominate. I am having some trousers made by Caliendo ( wonderful at Euros 550 ) and a discussion ensued about the length of the English bespoke jacket I was wearing. Elia was shocked by how long it was. To my mind a jacket simply must cover the seat comfortably. If you go back to classic writing such as that by Alan Flusser a jacket should reach half of the total height of a man. That doesn’t seem to be the case with Italian tailors. On separate note a further discussion entailed about very light grey trousers. and whether these were formal enough for office or evening wear. Any thoughts. Interesting, thanks. I actually find Elia’s length a nice compromise – covers the seat, but not too traditional English in length (which can depend on a more structured, sharper cutaway to work I find). But yes, covering the seat is an objective point, most other things are subjective. Interesting sartoria but prices are crazy. I can got beautiful bespoke in Naples for 1,200-2,500 Euro. It’s ironic to me that they are offering Florentine tailoring without a concave shape to the lapel. Maybe I have just come to see the Florentine style as synonymous with Liverano, but I find the concave lapel shape the most appealing aspect of the cut – the creation of ” )( “, not ” Y “, which this lacks. And their prices are comparable to Liverano, a well established brand with a track record. Simon, I am under the impression you have stated in the past that you pay full price for your commissions. Is that still the case? This just seems like a huge price to pay for what I see as a dicey mix of an “unretired” tailor, brand new apprentices, and a trouser maker you have been less than pleased with in previous reviews. I don’t always pay full price for commissions; I often receive a discount. I do nearly always pay, however. In this case I had cloth from Holland & Sherry already, and they offered a large discount in order to try out the new service. Any product or service could have its price increased two or three times with proper marketing and affluent customer base. Ambrosi and Bemer have the clientele and with little marketing it will be happily paying those prices. From a business perspective it is great. I’m happy for them because they may be the first generation of makers living better than customers. Does it matter when getting a bespoke suit whether it is the head cutter who does the fitting personally? From my understanding it would be better that a head cutter personally measures you as opposed to a Store Manager when some of the information might be lost in transition. What are your thoughts on this? 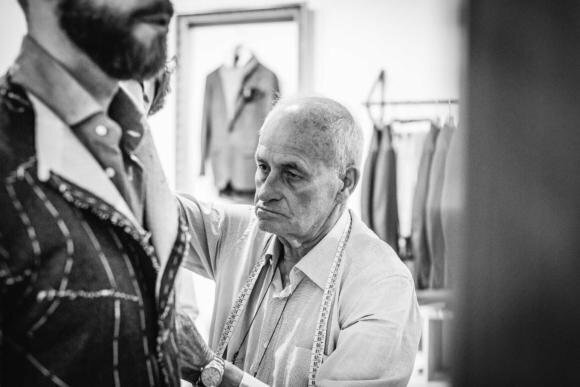 Will there be a compromise in quality when the person cutting the suit is not the fitter? Many Thanks for the reply Simon! Simon, you may give me your opinion. Is the ready-to-wear collection reasonably priced in matters of its quality and level of work? There’s a lot bound up in whether something is ‘reasonable’ or not. I also don’t know their exact costs. But it is more expensive than much else in our market, while still being cheaper and better value than most of the big designer brands. Thanks Simon! Could you please name a few houses offering ready-to-wear in a similar quality and level of work? When can we expect your review of the final suit? 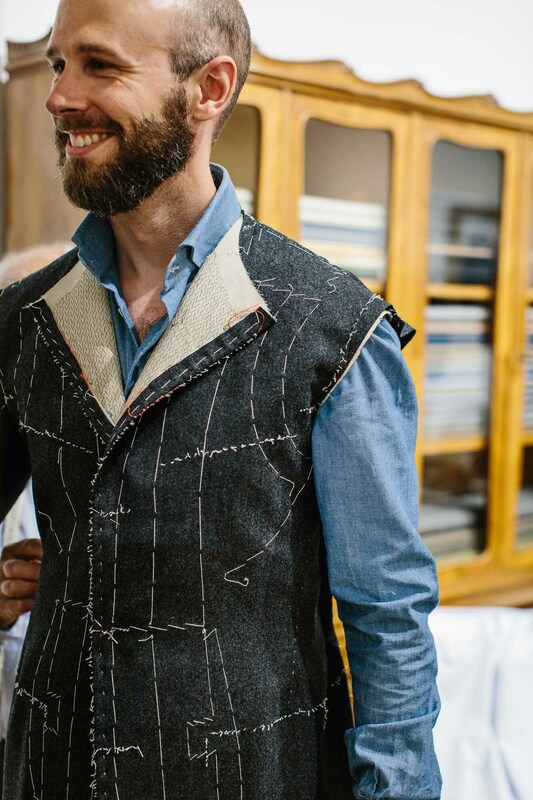 Could you name some tailors from Abruzzo as examples, please? When will you be posting the final review for the Vestrucci suit?